Zecharia Harris-Scott scored 11 of his game-high 25 points in the fourth quarter as East erased a double-digit deficit to win its second straight game. Harris-Scott connected four times from the floor and converted all three of his free throw opportunities to pace the Eagles which outscored Wilson 23-9 over the final eight minutes. Damani Barley finished with nine points for the game and hit a pair of triples during the rally. Dyllon Scott scored 16 for East, and Chaz Washington added 10. Wilson’s Robert Davis scored 16 of his team-high 21 points in the first half to help the Wildcats to a 36-33 lead at the break. Arthur Wilson buried a pair of 3-balls in the third quarter when Wilson extended its advantage to 11 at 62-51. Other scorers: East – Maurice Coney (7), Kai McCullough (4) and Kaori Barley (3). Wilson Magnet: Brennan Clark (17), Arthur Wilson (9), Christian Harmon (9), Malikk Johnson (9), Tony Bradley (4) and Desi Floyd (2). Tahjir King led four in double figures, and Devonte Goins posted a double-double as Franklin won for the sixth time in seven games. King led all scorers with 22 points to go along with six rebounds, two blocks and two steals. Goins connected four times from 3-point land to finish with 16 points while handing out 11 assists and collecting seven steals for the Quakers. Tyrone House had 12 points and five rebounds. Brandon Moore had 17 points, six rebounds and three steals. Anthony Smith chipped in with six points and Tyree Spann had five. Gino Pellett paced Spencerport with 18 pints. Ben Reding had 12, followed by Jon Taylor with nine. Nick Thibeau and Patrick Uebelacker added seven apiece. Cartier Jefferson (5), Trey Kubitz (4) and Alex Anderson (3( rounded out the scoring for the Rangers. Despite 44 points from Keith Slack, Gates-Chili (No. 25 NYSSWA Class AA) saw its eight-game winning streak snapped. Jakhi Lucas scored 11 of his team-high 30 points in the first half as UPrep 30-22 lead at the break. Lucas converted 7-of-10 from the free throw line for the night. Teammate Na’Zea Folks added 18 points. Kayshawn Ross hit 7-of-7 from the stripe and finished with 13 points, and Christian Jefferson scored 15 to round out a balanced UPrep scoring attack. Slack poured in 18 points during the fourth quarter when G-C outscored UPrep, 33-24. Adam Williams scored 16. Tre Green added nine. Other scorers: Gates-Chili – Devin Walton (3), Mair Morrison (2), Traylan McCray (5) and Mitchell Harris (1). UPrep – Raekwon Dargan (5). Tah’Jae Hill scored 17 points, and Mitch Carr had 15 for Hilton which jumped to a 38-25 lead at halftime. The win was the second straight for the Cadets and fifth in the last six games. Joey Gombatto connected three times from 3-point land and finished with nine points. Jackson DiPalma had a pair of triples and chipped in with eight points. Evan Insley and Anthony Stephenson scored 12 apiece to lead Greece Arcadia. Sean Crowell added six points for the Titans. Hilton outscored Arcadia 19-8 in the second quarter. Other scorers: Arcadia – Evan Caufield (3), Elijah Barnard (2), Adam Hurlbutt (2), Travers MacNeal (2) and Casey Amato (1). Hilton – Jason Story (3), Noah Malta (5), Najee Daniels (2), Colin Burkis (5), Jack Gombatto (3) and Ryan Kurtz (8). Kamerin Poromon scored 17, and Griffen Stella added 12 as Churchville-Chili won for the third third time in the last four games. Marcellus James and Marcus Postell added eight apiece. The Saints broke open a tie game at half outscoring Brighton 15-7 in the third quarter. Brighton’s Matt Falter connected four times from behind 3-point land and finished with a game-high 20 points. Other scorers: Churchville-Chili – Terrence Wilson (5), John Keele (4) and John Bagley (5). Brighton – Nathan Martin (2), Chase Seibold (8), Jack Carl (5), Lukas Stanat (2), Jack Falter (4), Nate Sponsel (2) and Sam Zarkowsky (3). The Kings used key runs in the first and third quarters to help lock down the victory. Midway through the third period, Kidtrell Blocker sparked an 11-4 spurt with a pair of layups. 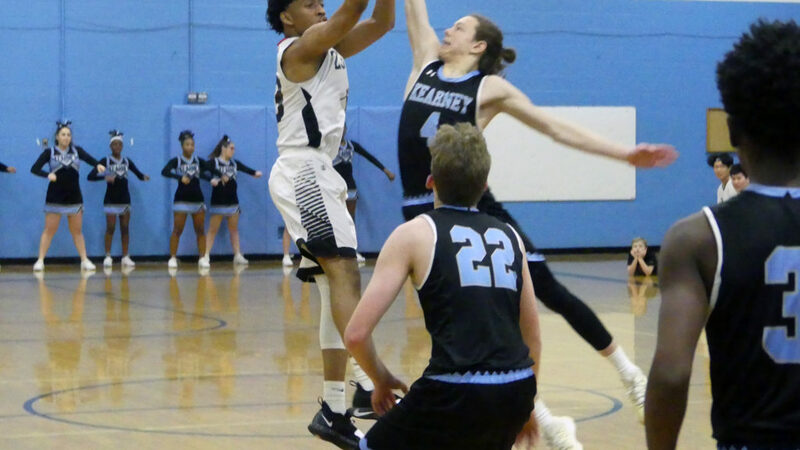 Junior guard Michael Gentile hit a long-range shot, Antwan Williams made a layup, and senior guard Jamal Williams knocked down a fadeaway mid-range jumper for a 57-42 lead, the largest of the game. During the run, the Kings held the Knights to five missed field goals and three turnovers in 10 possessions. READ MORE. The Knights received the message on Tuesday, as did their opponent, Webster Schroeder. The host Warriors (7-10) challenged McQuaid in a contest that featured five ties and 12 lead changes, all in the first half. The last of those lead changes was enough for the Knights (12-4), who went on an 8-0 run to end the half. READ MORE. Logan Blankenberg scored 26 points to become Wayne’s all-time leading scorer. The senior guard connected four times from 3-point land and passed Sammy Weech who had held the top spot in program history since 1996. 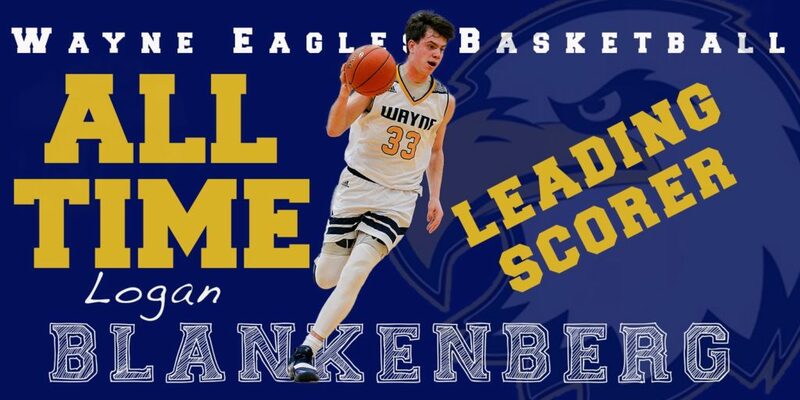 Blankenberg has 1,127 total career points. Nick Carmichael scored 17, and Logan Holgado added 11 in the win, Wayne’s eighth straight. Billy Thomson chipped in with five points. Kyle McCann and Chris Weston scored seven apiece to lead Midlakes. Other scorers: Midlakes – Matt Mattoon (6), Trevor VanNostrand (5), Sam Day (4), Nate Mahoney (4), Devin Hicks (3), Kaleb Mahoney (3), Gavin Lathrop (2) and Matt Crouch (2). Wayne – Jaiden Burlee (4), Gavin Lennox (3), Brandon Nowak (2), Caleb Kornaker (2) and Max LaRocco (2). John Rath, Derek Edick and Nathan Warters each connected from 3-point land in the fourth quarter when Kendall broke open a tie game. Warters paced the Eagles with 20 points for the night. Edick added 18, and Rath chipped in with 12 points. Dale Steffen (4) and Mason Kuhn (3) rounded out the scoring for Kendall which has won back-to-back games. Edick added seven rebounds, five steals and four assists to his effort. Rate had eight rebounds. Elba’s Jon Boyce led all scorers with 22 pints. Colton Dillon added 12 points for the Lancers. Collin O’Halloran (8), Zach Marsceill (5), Greyson Huntington (3), Evan Hare (2) and Tyler Stevens (1) also scored for Elba. Jayden Peters led Newark with 25 points. Mason VanDeMortel added 15. Kyle Berma scored 13 for Penn Yan. Mount Morris won its seventh straight game. Jesse Pensyl paced Whitesville with 11 points, seven rebounds, four steals, three assists and two blocks. Brendan Jackson added 10 points. Colby Gaines grabbed eight rebounds, handed out four assists, scored six points and blocked two shots. Chris Gullett also dished four assists. Gullet also collected four steals, six points and three rebounds. Dylan Acor scored six points and had five rebounds.